Researchers from Aston University and ITMO University demonstrated a new method to fabricate optical microresonators with unprecedented precision of less than the diameter of a single hydrogen atom and 100 times less than the current fabrication precision of similar devices. The possibility of creating microresonators with this precision can enable the development of more complex optical circuits and possibly allow engineers to use light for long-term information storage. In the study, published in Optics Letters, Michael Sumetsky and Nikita Toropov described the structure of bottle microresonators produced in such a manner that the difference between their size does not exceed 0.17 angstroms. This variation in size is 10 times smaller than the diameter of a hydrogen atom and 100 times smaller than a nanometer. For comparison, current manufacturing precision of microresonators is still measured at the nanoscale. Such a leap in fabrication precision can significantly improve the efficiency of future optical devices. Photons have no rest mass and are said to exist only in motion. This is one of the main obstacles to using light for information storage. Photons cannot be stopped. However, it is possible to delay the data flow carried by photons—for example, by trapping the light beam with a series of microresonators. A bottle microresonator is a tiny thickening of the optical fiber. The signal delay in such microresonators is due to the "whispering gallery" effect: once inside the microresonator, a light wave is reflected from the walls and starts circulating. Due to the spherical shape of the microresonator, light can circulate for quite a long time, which significantly slows down the propagation of photons from one microresonator to another along the fiber. The direction of light can be regulated by changing the shape and size of the microresonator. However, any change in these parameters must be very subtle and exact, since even the slightest defect on its surface can send the beam astray. "When light circulates for a long time, it starts to interfere with itself," says Michael Sumetsky. "If an error crawls in during the fabrication of the microresonator, we lose control of the system. That is why there are two requirements that must always be met: minimum deviation in dimensions of the microresonator and low light loss. Our microresonators comply with both." Remarkably, this technology is not based on any existing methods and represents an entirely novel approach to creating microresonators. "We did not intend to improve any existing technologies, but rather worked out our own way," says Nikita Toropov. "My coauthor, professor Sumetsky, deserves the credit for this achievement. Several years ago, he created a new technological platform for fabrication of microresonator circuits called SNAP (Surface Nanoscale Axial Photonics)." 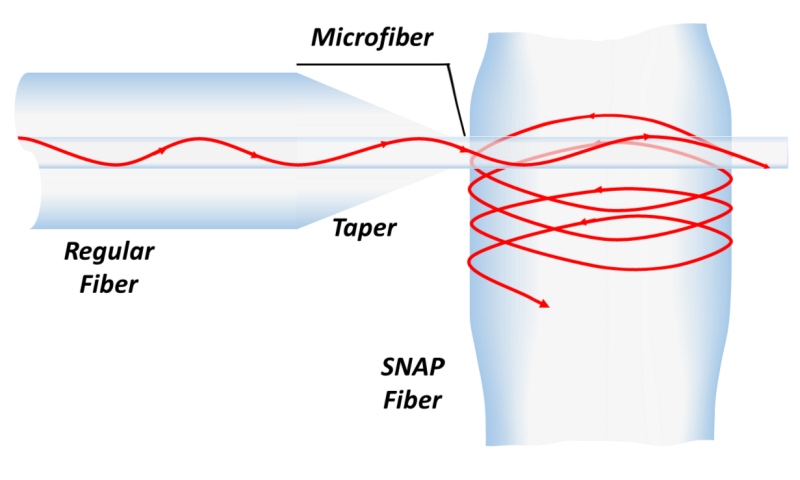 The essence of the SNAP method lies in controlled introduction of nonuniformities onto the fiber surface by a laser. It is crucial that the laser does not melt the fiber, but anneals it removing the strains frozen inside. When these strains disappear, the fiber swells a little and a microresonator forms. A significant advantage of the new technology is its simplicity. "Our technology does not require vacuum and is practically free from "wet" processes, which considerably lowers the cost. 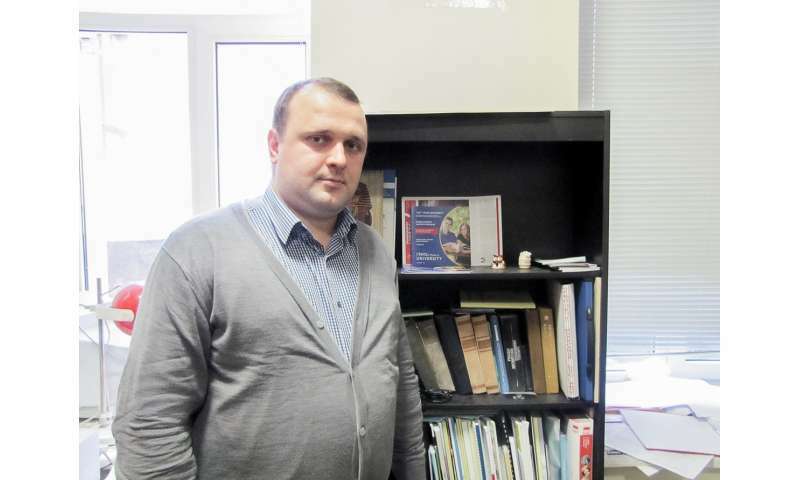 But what matters most of all is that this is a step toward all-optical devices that will improve the quality of data transmission and processing and will increase energy efficiency," adds Nikita Toropov. According to the researchers, the fragility of the tapered microfiber used to feed light into the resonator is a challenge. "This fiber is 50 times thinner than a hair," notes Nikita Toropov. "It is simply too easy to break, so we had to make new ones repeatedly. Quick fabrication of such microfibers remains out of reach." Now, the researchers are planning to continue the development of technology for fabrication of advanced SNAP devices for applications ranging from ultrasensitive measurement devices to quantum computers.